I live in Scotland. A lot of people are often surprised at that. They’re also often surprised to hear that DFID has a large office in Scotland, just on the outskirts of Glasgow. 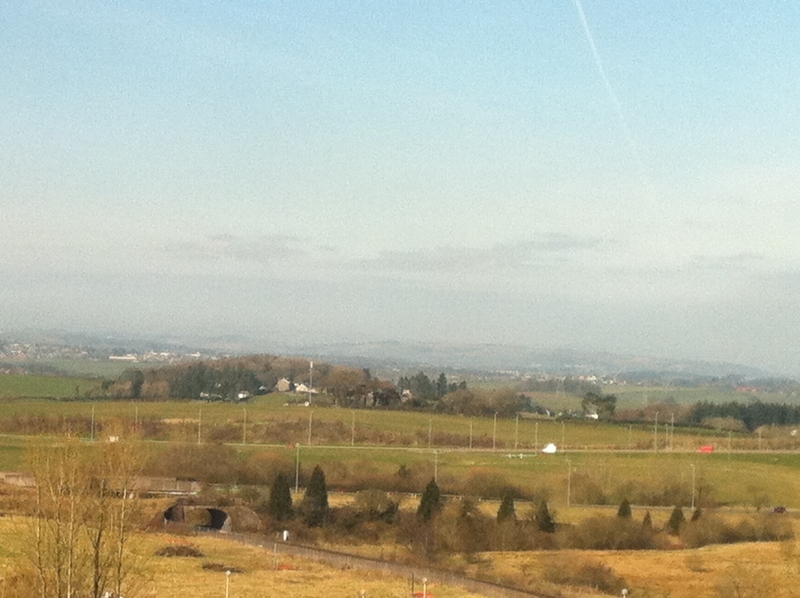 From my desk on the top floor I can see rolling hills and woods. On a sunny day, it’s pretty beautiful, and everyone in the office smiles lots. Talking of weather, it’s Climate Week here in the UK, so I finally worked up the courage to calculate my carbon footprint. And I discovered that I’m living a greener life here in Glasgow compared to London. I was initially astounded – particularly as I’ve been developing a bad habit of driving to work occassionally, which I am trying to stop. But when I looked at my footprint more carefully, it was obvious why. It’s my home. My husband and I currently rent a smaller flat in Glasgow than London. Even though we now have electric heating, it takes up much less time and therefore carbon to warm up our flat, and we’re very conscious about turning our heaters and appliances like the TV off to avoid high bills. For most people in the UK, their home activities, often determined by habits and fuel prices, make up the largest component of their carbon footprints. A lot of recent successful development work has been focusing on habits as well as prices. However, my footprint is due to change… We’re hoping to move into a larger house. So I’ll need to do even more to avoid emitting carbon – especially if I’m ever going to manage to emit just 2 tonnes by 2050 (this is a government target). Most of my extra actions – from using energy efficient lighting to cutting down car and long-haul travel – will save money or free up our income over time for us to invest elsewhere – for example in eco-friendly funds, local businesses or charities, or in our family’s education. But if saving and investing in growth is possible to do by going green as individuals, it’s strange that it doesn’t seem to be so clearly possible at an aggregate, country level. It’s partly a problem of measurement. The excellent Act on CO2 calculator that I used (NB: this Standard & Chartered calculator is probably the best one to use if you’re outside the UK) is based on daily consumption – measuring my “lifestyle” emissions rather than “sunk” emissions. By sunk emissions I mean those that occur when products such as homes, dishwashers and cars are manufactured. They can be disproportionately huge, particularly if produced in a country with abundant coal, gas or oil. But the activities that create sunk emissions are a key contributor to economic growth at a country level. This means that even if reducing my lifestyle emissions leads to savings and growth, if doing so reduces the demand for sunk activities at the same time (e.g. if it reduces the demand for TVs), then there is a possibility that economic growth will stall. This is a key reason why scepticism is sometimes expressed about the potential for green growth in developing countries especially if the donor community doesn’t meet its aid commitments. But while I agree that more aid is crucial, I don’t find the above reasoning persuasive. It assumes that the world is constant and that technology doesn’t change. For example, it assumes that it will always be cheaper to build homes using steel, and that new materials that have both lower costs and lower emissions won’t emerge. It assumes that we will rely on individual travel and letters to communicate and pay our bills, rather than wireless tablet computers. The world doesn’t work that way. We are constantly searching for new ways to do things – and in such a world it’s likely to be beneficial, not costly, to abandon old methods quickly. The development community is already seeking opportunities to drive economic growth and poverty reduction through new, cutting edge technologies, even in the poorest of countries. There are many more new high end technologies we need to examine creatively for their potential to contribute to growth, development and action on climate change. We forget that assumptions are often proved wrong. I was proved wrong with my footprint in Glasgow versus London. I wonder whether detractors of green growth in developing countries will find themselves in a similar situation in coming years.